The Immigrations and Customs Enforcement agency has made it a point to arrest people when they drop off their kids at school, at hospitals, and when they’re just trying to get their wallets back. One of its major targets has been court buildings, an issue which the New York City Democratic Socialists of America and other groups are organizing around. But as one incident showed yesterday, the New York state courts aren’t interested in getting in-person feedback. A group of seven activists attempted to deliver those signatures to DiFiore’s office at the Office of Court Administration building in Manhattan yesterday afternoon. “We didn’t necessarily anticipate [DiFiore] being there, but we wanted to bring them to her office,” Stevens said. But almost as soon as they got there, Stevens said, they were met with resistance from court officers. “As soon as we got to the floor, we were very quickly surrounded by court officers who told us that we weren’t allowed to be on that floor,” he said. The DSA chapter posted a video of the incident on Facebook, which you can watch below. New York state courts spokesman Lucian Chalfen disputed the activists’ version of the incident. “With regard to yesterday’s incident, the individuals involved misrepresented where they were going and knowingly entered nonpublic areas of the building,” Chalfen told Splinter in an email. 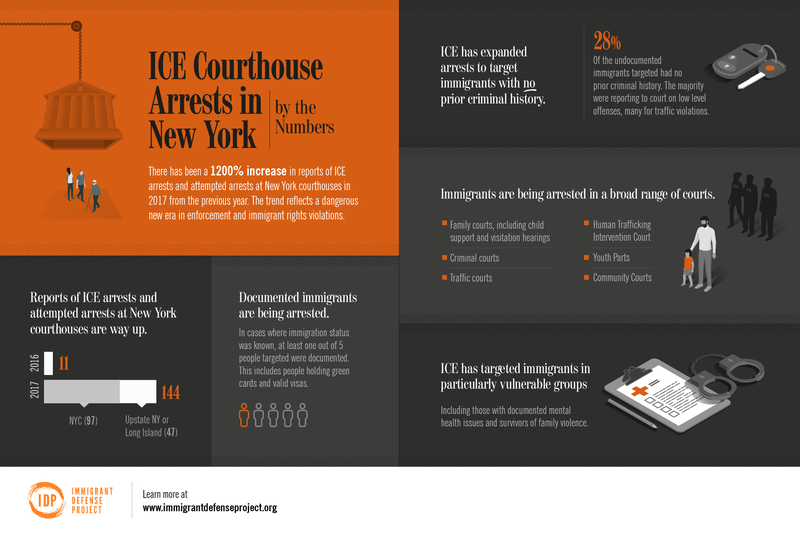 But Chalfen told Splinter that although the New York courts “request that [ICE] treats all courthouses as sensitive locations” and that a January ICE memo regarding courthouse arrests “is a direct result of our communications with ICE officials on the national and regional levels,” they ultimately can’t stop ICE agents from entering the courts and arresting people. Either way, Stevens says that the NYCDSA and its allies will keep campaigning for ICE agents to be kept out of the courts.